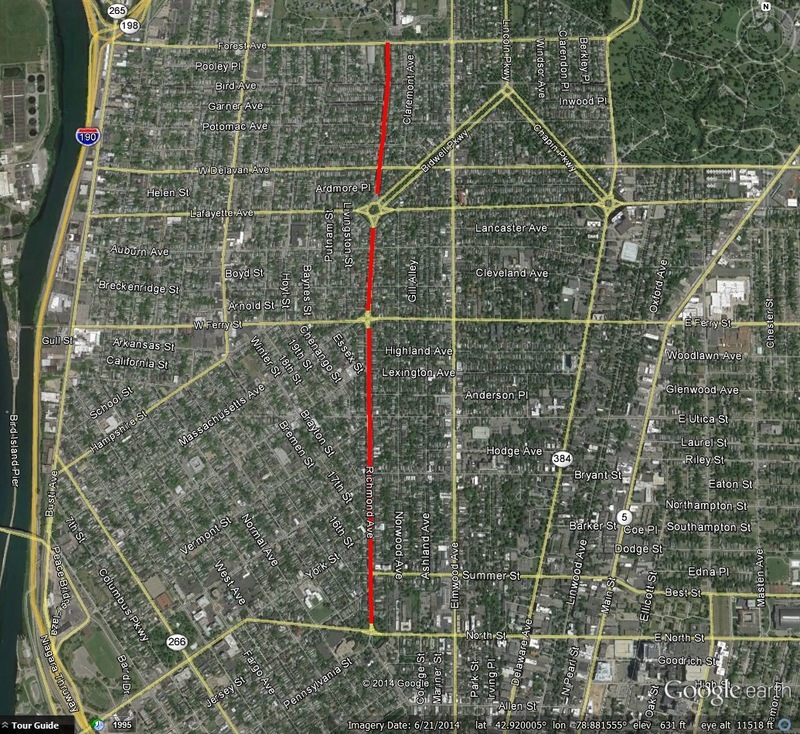 Richmond Avenue runs north-south through the West Side of Buffalo, running between Forest Avenue and North Street. The road was originally known as Rogers Road and served as a trail from Buffalo to what was known as a Shingletown area in the north. Even when the City reached to North Street, Shingletown was still mainly open fields used for grazing animals and raising vegetables. The most prominent building on the street was a tavern located on a terrace within a fruit orchard at the corner of Rodgers (now Richmond) and Utica Avenues. The tavern allowed travelers heading between Buffalo and Black Rock a place to rest. Residential development of the area increased in the 1880s and by 1900 the area resembled its current appearance. The street was named in 1879 in honor of Jewett Richmond, who was involved in the salt and grain industries. 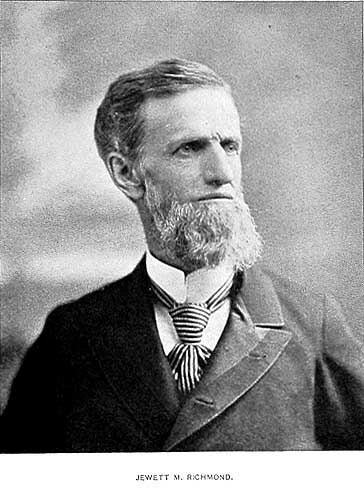 Jewett Richmond was born in Syracuse in 1831. He entered the salt business at a young age and began shipping salt to Buffalo and Chicago. On his trips to Buffalo, he saw Buffalo’s potential to become a grain center. He moved to Buffalo in 1854 and entered the grain business, building a grain elevator and establishing a company on the lakeshore. He built the Buffalo and Jamestown railroad. He was president of the Marine Bank, the Mutual Gas Light Company and the Buffalo Board of Trade. He also served on the City Council. At one point, in 1881, a delegation of prominent citizens wanted him to run for Mayor. Mr. Richmond was among 5 people they asked to run for Mayor that year (Major Doyle was another). Mr. Richmond suggested that they ask Grover Cleveland first. Grover Cleveland accepted, and was elected to his first important political post. Mr. Richmond was involved in many organizations. He was a member of the Young Men’s Association, which established the Buffalo Public Library. He was a trustee of the Charity Organization Society and the Forest Lawn Cemetery Association. He was a charter member of the Buffalo Historical Society (now the Buffalo History Museum), the Buffalo Society of Natural Sciences (now the Buffalo Museum of Science) and the Buffalo Academy of Fine Arts (now the Albright-Knox Art Gallery). 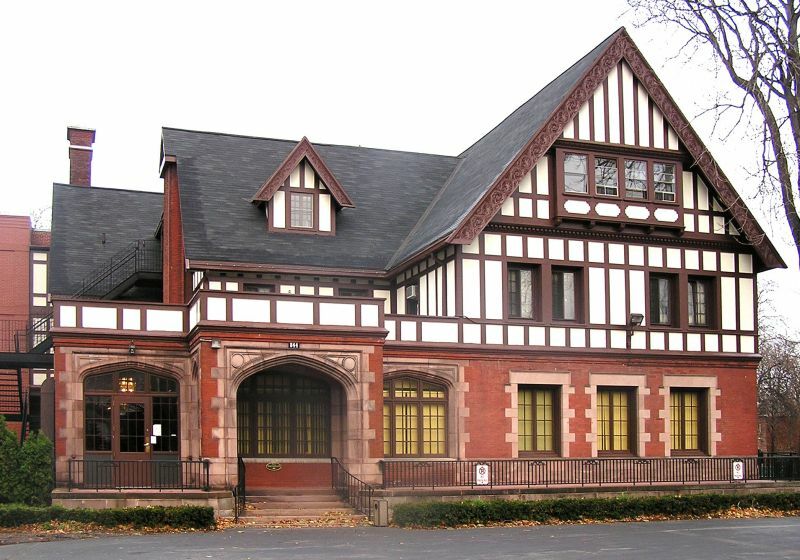 He was a founder of the Buffalo Club and the Country Club of Buffalo. The Richmond family lived at 844 Delaware Avenue. The property originally encompassed all of the land between Delaware Avenue and Richmond Avenue and was landscaped with gardens and some of the oldest trees in Buffalo. 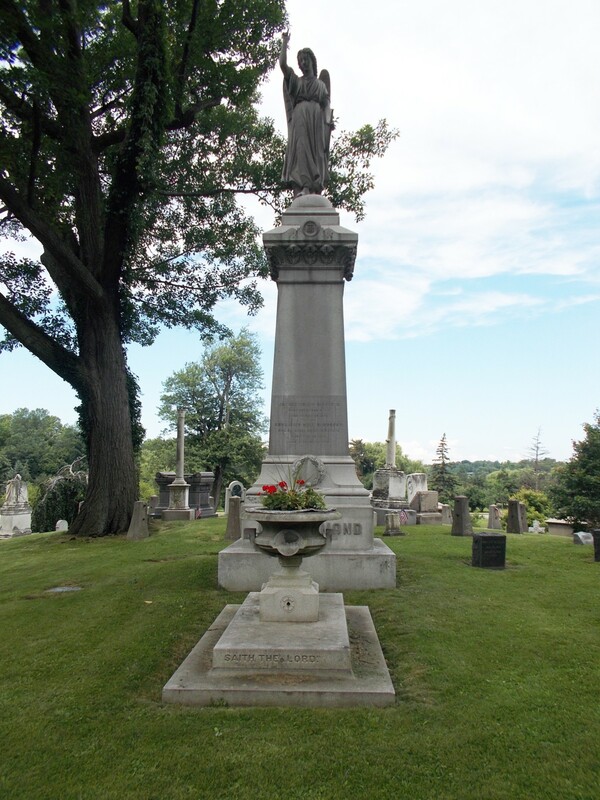 In 1879, a petition was submitted to City Council to rename Rogers Road to Richmond Avenue in Mr. Richmond’s honor. In January 1887, the Richmond house was destroyed by a fire. In 1888, a new home was built at 844 Delaware Avenue. The house is often referred to as the Lockwood house, as the 2nd owner of the house was Thomas B. Lockwood. The house is currently owned by Child and Family Services. Mr. Richmond died in 1899. In addition to the street, two stained glass windows are also dedicated to his memory – one in Westminster Church and one in the Richmond Chapel in St. Paul’s Cathedral. During the late 1920s and early 1930s, there was a proposal to extend Richmond Avenue further south of North Street. During the late 1930s, residents of Richmond Avenue petitioned to have the city change the name from Richmond Avenue to Richmond Parkway in order to preserve the residential nature of the street. In Olmsted’s plan, the “Avenues” were single drive lanes with double rows of trees on either side, while the “Parkways” were the double drive lanes with a carriage path in the center. The residents were determined to keep the street as only a street of “homes and churches”. Another proposal to extend Richmond Ave came to life after the construction of the Skyway in the 1950s. This proposal would have connected Richmond Avenue to the Skyway. None of these proposed extensions were built. You mention: He built the Buffalo and Jamestown railroad…I am curious about what was before this? As I mentioned to you my ancestors came through Buffalo 20 plus years prior to this time frame and headed south to Kentucky. They emigrated from Ireland. Any thoughts about their potential pathway? thx, Alesia PS: I think I have asked you a bit about this before, but you seems to be learning so much new information every time I read your blog–so I wonder….Thx! I have friends that used to have a large, drafty house on Richmond Ave – and it is nice to know the history – thx Angela – and I wonder if Lockwood Ave in South Buffalo is named after Thomas B. Lockwood. It’s my understanding (I haven’t researched it too much yet) that Lockwood Ave is named after Thomas’ dad, Daniel Lockwood, but Lockwood library at University at Buffalo is named for Thomas, who donated the money to build the original Lockwood library (on South Campus). The history of Richmond Ave was enlightening, I had been told through my family the street was named after my Maternal great grandfather, Dean Richmond. He also was from Syracuse, president of the NY Railroad, involved in shipping, rails and canal. The Holland Land office in Batavia has info as well as the Richmond Library and Episcopal church. I will have to check into if there is a connection between the two. Interesting that you say that! Please let me know if there was a connection between the two! I know that Jewett had a brother Moses.